Editor's note: Peter Chi is a Research Fellow at the National Image Research Center of Tsinghua University and CEO of Beijing Lucky Earth International Culture Co., Ltd. The article reflects the author's opinion, and not necessarily the views of CGTN. The lunar New Year, more commonly known as Spring Festival or the Chinese New Year, will be celebrated on February 5 this year. It is the biggest festival and holiday in China. It is celebrated not only in China but also in few Asia countries that Confucianism used to be historically influential, such as Singapore, the Republic of Korea (ROK), Japan and Vietnam. Every year the Chinese people welcome the lunar New Year with a new zodiac animal, which rotates in a 12-year cycle, and 2019 will be the year of the pig. The Chinese New Year is similar to Christmas in the West in terms of family reunion. There are similarities to Christmas, but there are many different customs and traditions as well. The Spring Festival holidays have an official duration of seven to twelve days, and millions of people in China try to get home before New Year, to celebrate it with their families. It is the biggest travel season in China, and the most difficult time to get a ticket, either by plane or by train. In fact, it's considered the world's largest mass migration and this year nearly three billion trips are expected to be taken in China. Before New Year's Eve arrives, there is a tradition of cleaning your house to get rid of the bad fortune left behind in the previous year. Another tradition is to go shopping before the holidays, as many shops will be closed during the holiday week, and buying new items symbolizes new luck and fortune for the coming year. As in the west, Chinese people decorate their homes for the holidays, but not with trees or lights. Instead, they hang red papers with the Chinese character “Fu”, meaning good fortune, on the walls and doors. One of the most famous Chinese traditions is the exchange of the red envelopes, or red packets. It can be compared with Christmas gifts for family members, but instead of buying gifts, Chinese people put money into a red envelope and give it to their family and friends. Usually, older people give red envelopes to the younger generation. The typical Chinese New Year is celebrated with the family sitting together and having the New Year's Eve dinner at home. One of the dishes that will definitely be on the dinner table is Chinese dumplings, because they are shaped like the old golden ingots that were used as money in the old days, and they symbolize wealth and prosperity. Sometimes people put coins, peanuts or other ingredients into some of the dumplings, and whoever gets to eat it, will be blessed with wealth and happiness in the new year. After dinner, the family will sit together in front of the TV, to watch the annual CCTV New Year's Gala. Just before midnight, the hosts of the gala will start the countdown for the New Year, and when the clock ticks twelve, beautiful fireworks will light up the night sky. During the next few days after New Year's Eve, families start to visit each other's homes to check in on the relatives. They bring gift baskets, red envelopes and wish each other a “Happy New Year”. In rural areas, where they have big families, this tradition can last several days. After the family reunions, Chinese people tend to visit temples to pray to gods for good health and luck for the coming year. Later on, they like to visit the temple fairs in various locations. There are all different kinds of entertainment shows in these temple fairs, like traditional Chinese puppet shows, famous dragon dances, and other carnival activities. 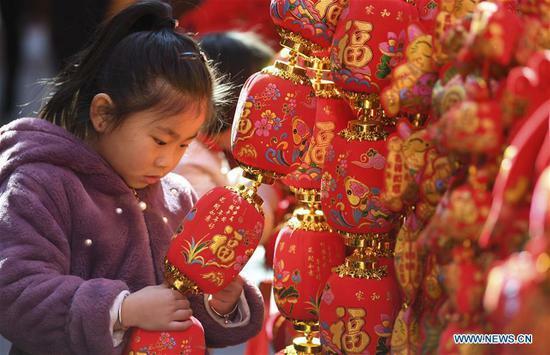 To summarize, the spring festival is the most important holiday for people in China, and Chinese abroad. Even if the people are working in other cities or foreign countries, and no matter how difficult it is to get a ticket, they will try their best to get back home to celebrate the Lunar New Year with their families. In my opinion, all these traditions and customs show how much Chinese culture values family, and how important it is to be with your loved ones during these precious few days. Wishing everyone a happy Chinese New Year and may health and happiness be with you in the Year of the Pig. Japan has scrapped the Lunar New Year practice for many years, and the research fellow of a first-class university of China doesn't know it, what a shame! Please update your information and data! Like many other nations in the world, none of them celebrate Chinese New Year! Hope you know what Chinese New Year is! Yes, a very good post. I thought you were right, but after a Baidu search I found that you are wrong, Japanese do not celebrate the Chinese New Year, they only enjoy the same new year like Westerners. If you do not believe me, you can Baidu or Google or Bing yourself.